As the death toll from the Central Sulawesi disaster continues to rise, a volcano has erupted in North Sulawesi. The National Disaster Mitigation Agency (BNPB) stated that they were short of food, water and sanitation supplies and facilities for more than 60,000 displaced people. Aid had started to arrive, but much more was needed, and fast. Challenges have escalated as the natural disasters have severely affected the infrastructure in the region, disrupting connectivity and disaster relief supply chains as well as local production chains. From a supply chain perspective, emergency response to natural disasters can be divided into at least two stages. The first is the supply chain for disaster relief that Sulawesi currently needs. The second is the reestablishment of production chains. Following the 2004 Indian Ocean earthquake and tsunami, many studies discussed the topic of disaster relief supply chains. In his 2005 thesis on the disaster relief supply chain following the 2004 earthquake and tsunami, TE Russel highlights enhancing coordination between humanitarian organizations, financial supply chains (to ensure available cash reserves), and the monitoring and evaluation system for operational improvement. Other lessons are worth noting. In disasters, while communities around the globe respond with generosity, deciding and selecting what is appropriate for the affected people is not a straightforward task. The goods and services that aid recipients need and — equally important — are willing to use can be culture-specific, technology-specific and weather-specific, among others. Local wisdom and understanding is an important element to ensure this. Unsolicited goods may waste significant resources for relief workers in their sorting, packing and distributing, even disposing. In emergencies, time is of the essence. Nevertheless, a “general” understanding of supply chain management is important in relief efforts from humanitarian organizations as well as governmental agencies. According to the Fritz Institute, which specializes in disaster relief, approximately 80 percent of all relief operations interact with supply chains at some point. Infrastructure also remains a prerequisite for all supply chain activities, highlighting the urgency of infrastructure emergency recovery. Using the latest technologies should also be continuously explored, from using drones to deliver aid to isolated areas, management apps to track deliveries and to satellite imagery for early assessment of affected areas. The ultimate focus of these activities must be clear and must be made clear to all involved parties: to save lives and minimize further loss. Recovery takes time. However, the affected areas will eventually arrive at the reconstruction stage. 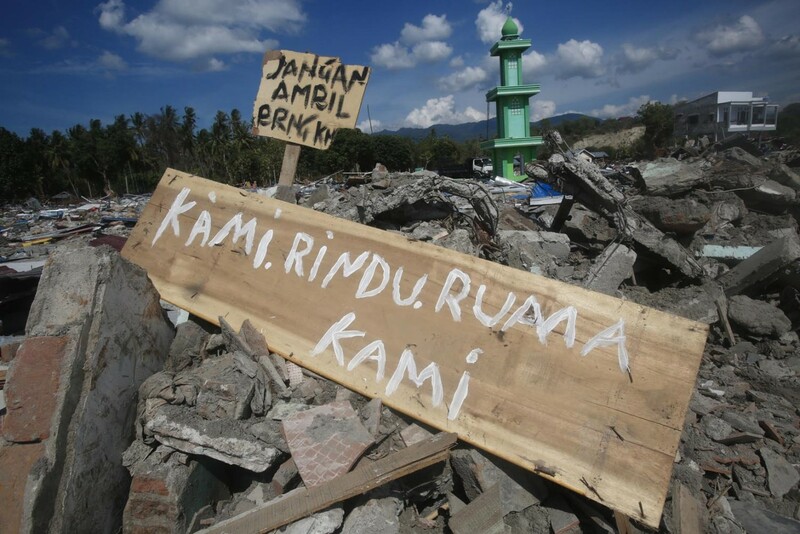 In the case of North, Central and West Sulawesi, it is not clear yet the extent to which the earthquake, tsunami and volcano eruption have affected the production of main commodities in these provinces. In 2016, North Sulawesi exported animal or vegetable fats and oils, including US$600 million of crude coconut oil — more than two-thirds of the province’s total exports. Meanwhile, iron and steel as well as mineral fuels, with export values of $742 million and $797 million, respectively, accounted for almost all of Central Sulawesi’s total exports in 2016. The three provinces also exported food and agricultural commodities. West Sulawesi’s food industry exported $335 million commodities in 2016, while North and Central Sulawesi exported around $60 million and $3 million in fish and crustaceans, respectively. Natural disasters may cause supply chain disruptions in various ways. Businesses might lose workers to death, injury or illness, as well as from leave to partcipate in relief operations; the priority given to emergency assistance may mean lack of transport and logistic facilities; fuel prices and other production inputs may soar. The focus will gradually shift from responding to loss to rebuilding competitiveness. Programs and policies to support domestic smallholders may allow them to resume operations. These include business planning assistance, production equipment purchases, risk management, marketing and staff wellness. This is the stage at which universities, research institutions, industry associations, the private sector and wider communities can play a role. Aspects of trade should be considered in both disaster relief supply chain management and post-disaster recovery, given Indonesia’s engagement in the global economy, such as through free trade agreements (FTAs) and its active participation in regional supply chains. In the event of disasters, duty-free or tax-free entry is ideally provided to relief supplies. The 21st-century FTAs’ coverage beyond tariff elimination also means that other aspects, such as compliance with sanitary and phytosanitary measures, simplified customs procedure, addressing cross-border data transfers and intellectual property (such as transferring scientific data that might be useful for an early warning system in other countries), movement of persons, investment policies, post-disaster recovery economic and technical cooperation and government procurement — all of which have increasingly become common features of an FTA — become relevant in discussing natural disasters. A challenge is how to ensure that trade policies allow appropriate assistance to be provided to disaster-affected areas, while still largely addressing national as well as the trade group’s objectives and sensitivities. Granting an “exemption” for relief assistance is one way, but this may still involve some administrative burdens and require agreements with another country or other countries. Global trade communities have shown increased interest in the nexus between natural disasters and trade. The World Trade Organization held a workshop in April to discuss this nexus, highlighting the impact of recent disasters on its members’ trade and development and outlining the trade dimension to disaster response, recovery and resilience. Yet the details remain wanting. It is in Indonesia’s interest to focus more on further enhancing its disaster relief supply chain and better understanding the nexus between trade and natural disasters in its response to natural disasters, as well as ongoing trade negotiations and future reviews of existing FTAs. The writer is a senior agribusiness lecturer in the Department of Economics at Deakin Business School, Deakin University. She has studied trade and value chains, particularly in the agriculture sector.